This article is about the movie and its soundtrack. For the musical, see Godspell. For the musical's album, see Godspell (1971 Off-Broadway Cast). Godspell (also known as Godspell: A Musical Based on the Gospel According to St. Matthew) is the 1973 film adaptation of the Off-Broadway musical Godspell created by John-Michael Tebelak with music and lyrics by Stephen Schwartz. Directed by David Greene with stars Victor Garber as Jesus and David Haskell as Judas/John the Baptist, the film is set in contemporary New York City. John-Michael Tebelak is credited as co-writer of the screenplay and served as the creative consultant, although director David Greene said Tebelak did not write the screenplay. The structure of the musical is, in large part, retained: a series of parables from the gospel of Matthew, interspersed with musical numbers. Many of the scenes take advantage of well-known sites around an empty, still New York City. John the Baptist gathers a diverse band of youthful disciples to follow and learn from the teachings of Jesus. These disciples then proceed to form a roving acting troupe that enacts Jesus's parables through the streets of New York. They often make references to vaudeville shtick. The song "Beautiful City" was written for and first included in the film, while the songs "Learn Your Lessons Well" and "We Beseech Thee" were omitted. The melody for "Learn Your Lessons Well" is used briefly in an early scene of the film and again as incidental music, and snippets of both "Learn Your Lessons Well" and "We Beseech Thee" are heard in the scene inside Cherry Lane Theatre when Jesus plays their melodies on the piano during the story of The Prodigal Son. The exterior and interior of the Cherry Lane Theatre – where the first musical version of Godspell began its off-Broadway run the year before the film was shot – where the story of The Prodigal Son is told. The long approaches of the Hell Gate Bridge on Randall's Island, where the disciples switch to their colourful clothing after baptism near the start of the film, and where they carry Jesus' body through the arches, creating a barrel-vaulted cathedral effect, after his crucifixion on a chain-link fence. Vocally, the chorus is very much in the same style, but solo parts are, at times, more lyrical. Notably, in "All Good Gifts", whereas Lamar Alford had used a dramatic tenor voice, Merrell Jackson uses a lighter voice and falsetto for the high ornament which creates a joyous effect. Regarding the band, all four of the musicians from the original stage production and cast album were retained for the film recording. These musicians were Steve Reinhardt on keyboards, Jesse Cutler on acoustic and lead guitar and bass, Richard LaBonte on rhythm guitar and bass, and Ricky Shutter on drums and percussion. Reviewer William Ruhlmann explains that by having a larger budget than had been available for the stage, Schwartz was able to expand the line-up by adding key studio personnel like lead guitarist Hugh McCracken (on "Prepare Ye (The Way of the Lord)") and keyboardist Paul Shaffer, a horn section, and six strings. Ruhlmann describes Schwartz as being "better able to realize the score's pop tendencies than he had on the cast album... this was a less complete version of the score, but it was much better performed and produced, making this a rare instance in which the soundtrack album is better than the original cast album. The film was entered into the 1973 Cannes Film Festival. Godspell received generally positive reviews in 1973. Allmovie Guide currently gives the film a three out of five rating. Various bands have covered songs from the film/musical. ↑ Vincent Canby (1973-03-22). 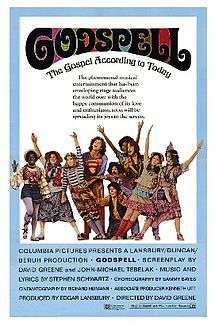 "Godspell (1973) The Gospel According to 'Godspell' Comes to Screen". The New York Times. ↑ “Tebelak and I are enjoying an ideally smooth working relationship.… But he is not codirecting the film with me. He did not write the screenplay; he participated only minimally in pre-production planning and discussions, and attended very few rehearsals." — Letter by David Greene to Variety, Dec. 6, 1972. 1 2 Ruhlmann, William. "Overview: 'Godspell: Original Motion Picture Soundtrack'". Allmusic.com. Retrieved April 22, 2015. ↑ "Festival de Cannes: Godspell". festival-cannes.com. Retrieved 2009-04-19.